The author of Graystone Tower asked me to review his adventure and I am happy to do so. I crossed the path with Jim the first time a long time ago when I wrote Savage Space. He provided me with a review copy of his adventure. This is a reading review, I have neither run nor played it. I try to avoid overly specific spoilers but if you read this you WILL be spoiled about certain aspects. You are warned. Players: get out. 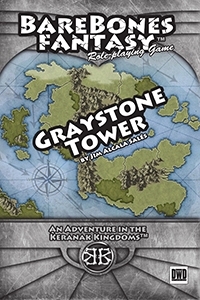 Graystone Tower consist of two PDF, one in the usual, good-looking BareBonesFantasy trade dress and one printer friendly. Additionally all maps from the adventure in 300 DPI JPG depicting the tower itself and an area map. Both are full color and look very nice. The Tower map is sparse, just showing the interior but no furniture or other details. Works for me though, makes it easier to be creative with a rooms contents and makes it possible to easily hand it to the players after the adventure when they want to make the place their own. The maps included are very re-usable, as usual from DwD Studios. The adventure aims at low-level characters. The basic premise: There is this tower where someone evil sits and someone hires the characters to clear it out. As a reward they can win the title to the Tower and the surrounding lands. This is a great price to win indeed, even though the setup is very formulaic. The PDF begins with a short overview of what to expect within. There is also some advice given on how to place the locale in the Keranak Kingdoms, BBF’s official setting. There are sidebars encouraging GM to change the adventure to suit their needs. I appreciate these tips, even though they aim at newer GM. That is not a bad thing at all. Before the characters actually reach the Tower they first have to travel along a road towards its. During that journey there are three different encounters. One ties to the deeper background of the Keranak Kingdoms and two set up the tower as a dangerous place as well as the potential enemy. There is one where the characters can help a victim of the BBEG with tips on how to “escalate” the situation in interesting ways, turning it into a dangerous roleplaying situation (Peasants with Pitchforks anyone?). Even though the encounters have numbers 1, 2, 3 the sidebar in the beginning advises any GM to not necessarily railroad the players in them. However on the map they are in the same order. You can shuffle the order of course, or leave something out. But still, the overall journey part is very straight forward . Door O‐2: Heavy Oak door, unlocked, untrapped, opens into room 2. Door 2‐3: Heavy wooden door, unlocked, untrapped, opens into room 3. I totally dig this. More adventures should use this kind of no-nonsense stat block for room descriptions. It shows me what I need to know at a glance. More detail in the text. If a room is occupied the creature or NPC stats are right there in a sidebar, so no searching. Very thought out. In classic dungeon crawl method the players sooner or later will discover that not everything is as expected. Sadly I feel the ending is not as strong as it could be. For one there is no motivation given for the final NPC. Why does he do what he does? A question I find important to answer. Also it seems written with the assumption that the players are not totally paranoid and a trusting lot. In my experience that is rarely the case. I would like to see more details here on ways this can go south and flow differently than expected. While the beginning of the adventure is beginner friendly the ending leaves you a bit alone. Because I can guarantee that not a single thing expected to happen here would happen in any of my groups. They are all a suspicious lot. Additionally some tips on roleplaying the character would be appreciated, as it is mainly a dialogue and any guidance is helpful in such a situation. Lastly there are some seeds for further adventures. The appendix contains all the NPC, new monsters and magic items. Everything easy to find. Overall a solid adventure, well written. Just a bit short of what it could be. There is this a good-looking hex map of the tower and surrounding area, but there are no locations given for further adventures. A missed opportunity I feel, especially considering the players can inherit the place. The ending could use some work, as it expects things going a certain way without offering any advice on what to do they don’t. In its sum the adventure does more right then wrong and I hope a new adventure by Jim improves on the groundwork he has done here. Overall for 2,99 it is a good offering, enough adventure to last you an evening with a cool player base as a reward for further shenanigans.